Design the premier issue of an art and design periodical using content culled from extensive library research. Acting as art director, develop the editorial style, publication identity and visual standards. Acting as editor-in-chief, assemble text into coherent articles and features. Acting as designer, organize all content and lay out entire magazine. 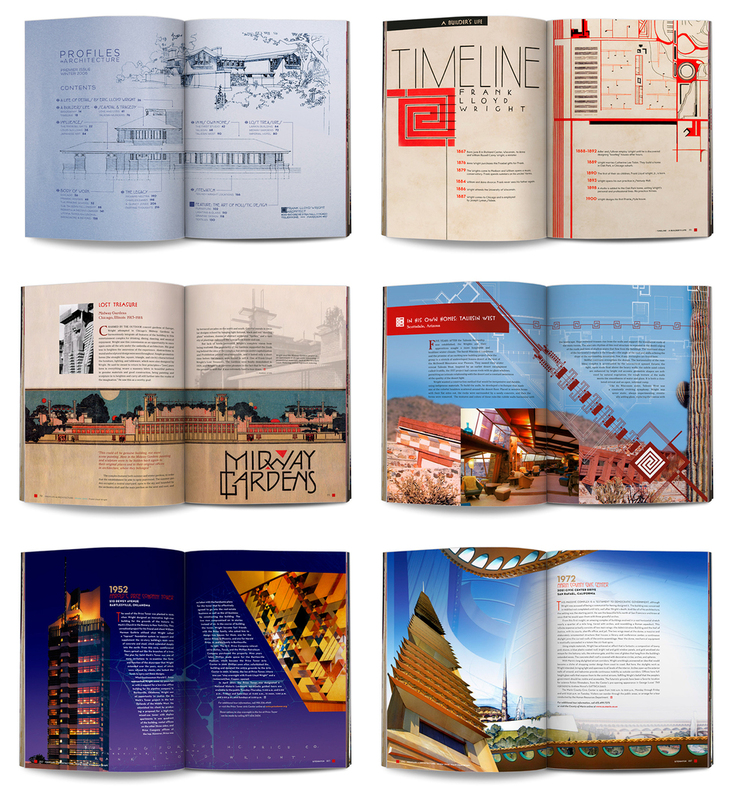 PROFILES IN ARCHITECTURE is a design quarterly which features a single personality per issue. The periodical is intended as a series of complete monographs to be collected and referenced by casual admirers and professionals alike. This 220pp premier issue showcases the career of Frank Lloyd Wright. Architecture fascinates me. Yet most architecture magazines I’ve seen are something of a terrible bore. The photography is luscious and the type is well set, but the layouts always leave me cold. There’s no stylistic unity and no immersion—no relationship between the structure of the layouts and the structure of the works. I designed this journal to address my own desire to see something more visceral about the subject on the newsstand. The audience for the publication is design and architecture professionals as well as casual admirers. Issues are intended to be collected to form a reference library of complete monographs on the world’s most talented and influential architects. Frank Lloyd Wright seemed the obvious choice to showcase in this premier issue, given not only his stature within the profession but also his mainstream appeal. Selecting someone more obscure might adversely affect the initial sales and exposure in launching this new quarterly. More than any other quality, Frank Lloyd Wright embodied a holistic approach. He created not only buildings but interiors, furniture, graphics, signage, typography and even his own clothing. To distinguish this section from the rest of the general content, I designed an isolated palette, type treatments and folios. In Wright’s work there is a clear break between his earlier style, which was firmly rooted in the Arts & Crafts movement, and his later, more modernist approach. I used separate colors and typography for each. Although I chose the Gotham family for general use, including the masthead and folios, each issue of PROFILES IN ARCHITECTURE is set in a variety of typefaces appropriate to the featured architect and their era(s). I presented Frank Lloyd Wright’s work in two voices—one for his earlier Arts & Crafts period and another to mark his later, more modernist approach. P22 type foundry is renowned for their work with museums and foundations to ensure historical accuracy, so I used several of their Wright-inspired and Arts & Crafts families. I set articles covering Wright’s Prairie work in Cheltenham, which was quite popular at the time. Richard Neutra studied under Wright, so the famed House Industries family based on his lettering seemed natural for Wright’s later work. I also set unique headers for tangential material. For example, a piece on Charles Eames features Futura exclusively. Frank Lloyd Wright’s favorite graphical scheme was black, white and Cherokee red, so I used these three to unify all sections. Wright’s early Prairie work was very earthen and organic. By using a warm, rustic color palette I strove to evoke a Midwestern nostalgia. In contrast, I chose a cool palette to compliment his late period, which was more stoic and modern.